TV HEALED: - I put my hand on the television, and got rid of a stomach disorder that was unlike anything I have felt neither before nor afterwards, says Unni Ingbre. - She was desperate, states husband Roy. Since April 2012, Jesus Heals Ministries has been broadcasting the television program "The Miracle is Yours" in Canada. Every Sunday night Canadians from the Atlantic Ocean in the east to the Pacific Ocean in the west can take in the message of Jesus' saving and healing power. Unni Ingbre in the city of Langley in Canada tried the TV- method after a month of tremendous pain. - Stomach pain swooped over me one day in April of last year. For four to five weeks I was in agony because of the pain. I could barely eat, and the little I managed to eat, went right through me. I was quickly shedding pounds. In one week I lost three to four kilos. - What did the doctor say about this? - I went for check-ups several times a week, and many tests were taken. My female doctor did not find out what was wrong. Since I could not tolerate food, water was pretty much all I managed to consume. I wondered what the origin of the problem was. - How was your sleep this time? - Since the abdominal pain was constant, it was almost impossible to get to sleep. I had very little strength to stand on my feet. - And what happened to you? - One Sunday in May of last year, I was sitting at home watching a channel called Grace TV. Here you, Svein-Magne, preach the Word of God and pray for the sick every Sunday night at eight o'clock. My husband Roy and I have known you since 1993, and we know what you stand for. In July last year you visited us in Langley. You prayed for my left eye that there was something wrong with. The healing came instantly. Since then, the ailment has been gone. Now I needed to receive prayer again. This was the first time through the TV. I was desperate - and in my agony I turned on the television. - I put one hand on the TV and the other on my stomach. Roy and I read promises of healing from the Bible. Then we went to bed. That night I slept like a rock - and woke up – healed! I could hardly believe it. I had to try this out. I made a real dinner with potatoes, meat and all kinds of accessories. I ate until I was full and I did not notice anything! Before I would get severe stomach pains when I ate, and then immediately I would run to the bathroom. The food went right through me! But now I felt no pain. It was all gone. 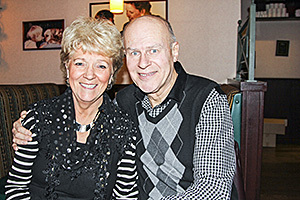 I was healed, thanks to the power of Jesus through the program "The Miracle is Yours," says the delighted 65-year-old, alternating between Norwegian and English. - I have told about the miracle to my doctor. She does not know what to say about what has happened to me. This is outside of human understanding. Because this is where God operates, says Unni, and goes on to order a juicy liver dish. She eats it without feeling anything, without pain - but as usual - with a smile on her face. - It is when we are desperate for a miracle that the miracle happens, Roy Ingbre concludes.